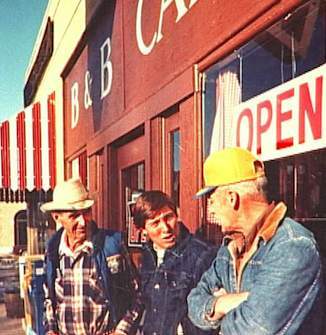 The historic B&B Café, known as the diner where a high-profile manhunt ended with the murder of Castle Rock Marshall Ray Lewis in 1946, is making new memories that make locals feel uplifted. The Colorado eatery, normally open only for breakfast and lunch, opened its doors on Friday and Saturday night so the whole town could help an ailing toddler. The owner, Robert Schoene, allowed an employee, who is a former Mexican chef, to use the B&B those two nights so he could prepare take-out and sit-down meals for people who were then asked to donate any amount they could for the cause. Groceries were donated, according to the Castle Rick News Press, and 100 percent of the proceeds will go to help Jenimae Michener, an 11-month-old Castle Rock resident born with — Treacher Collins Syndrome. How this fundraising event came about is because Jenimae’s mom was helping out someone else. Thanks to Glen Gibson for submitting the link on our Facebook Page!